1B Umpire Dale Scott ejected Blue Jays First Base Coach Tim Leiper for arguing a balk non-call in the top of the 3rd, HP Umpire Dan Iassogna ejected Blue Jays Manager John Gibbons for arguing a ball one call in the bottom of the 3rd, 1B Umpire Scott ejected Blue Jays RF Jose Bautista and 3B Josh Donaldson, and Rangers 2B Rougned Odor and Bench Coach Steve Buechele for fighting in the top of the 8th inning, and HP Umpire Iassogna ejected Blue Jays P Jesse Chavez and Acting Manager/Bench Coach DeMarlo Hale for throwing at Rangers batter Prince Fielder in the bottom of the 8th inning of the Blue Jays-Rangers game. In the top of the 3rd with none out and one on (R1), Blue Jays batter Donaldson hit a 3-2 slider from Rangers pitcher Cesar Ramos to left field for a fly out. Replays indicate Ramos stayed true to his natural motion in delivering his pitches and did not commit a balk, the call was correct. In the bottom of the 3rd, with one out and one on, Rangers batter Odor took a 0-2 fastball from Blue Jays pitcher Aaron Sanchez for a called first ball. Replays indicate the pitch was located over the inner edge of home plate and thigh high (px 0.681, pz 1.977 [sz_bot 1.340 / MOE 1.423]), the call was incorrect. In the top of the 8th, with one out and one on, Blue Jays batter Justin Smoak hit a 2-0 fastball from Rangers pitcher Matt Bush on the ground to third baseman Adrian Beltre, who threw to second baseman Rougned Odor, who attempted to throw to first baseman Mitch Moreland as Blue Jays baserunner R1 Jose Bautista arrived at second base. Replays indicate Bautista's slide violated the bona fide slide rule concerning interference at second base, prompting a bench-clearing incident and an automatic double play, the call was irrecusable. In the bottom of the 8th, with none out and none on, Rangers batter Fielder took a first-pitch fastball for a hit-by-pitch. Replays indicate the pitch was located inside and struck fielder on the backside, the call was irrecusable. 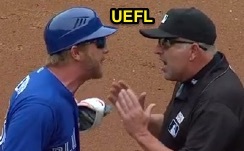 At the time of the Leiper and Gibbons ejections, the Blue Jays were leading, 1-0. At the time of the Bautista, Donaldson, Odor, Buechele, Chavez, and Hale ejections, the Rangers were leading, 7-6. The Rangers ultimately won the contest, 7-6. These are Dale Scott (5)'s 1st, 2nd, 3rd, 4th, and 5th ejections of the 2016 MLB regular season. These are Dan Iassogna (58)'s first, second, and third ejections of the 2016 MLB regular season. Dale Scott now has 9 points in the UEFL Standings (-1 Prev + 4*2 MLB + 2 QOCY + 4*0 [U] = 9). Dan Iassogna now has 1 point in the UEFL Standings (-1 Prev + 3*2 MLB - 4 QOCN + 2*0 [U] = 1). Crew Chief Dale Scott now has 8 points in Crew Division (1 Previous + 7 Correct & [U] Calls = 8). 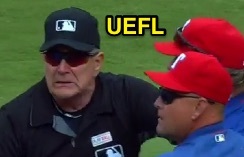 *This is the longest ejection report in the history of the Umpire Ejection Fantasy League. **These are the most ejections in one game since April 22, 2000 (11; DET-CWS, 2-brawl game). These are the 40th, 41st, 42nd, 43rd, 44th, 45th, 46th & 47th ejection reports of the 2016 regular season. This is the 19th Manager ejection of 2016. These are the 21st, 22nd, 23rd and 24th player ejections of 2016. This is Toronto's 2/3/4/5/6/7th ejection of 2016, 1st in the AL East (TOR 7; BOS 3, BAL, NYY, TB 1). This is Texas' 3/4th ejection of 2016, 1st in the AL West (TEX 4; HOU 2; LAA, OAK, SEA 0). This is Tim Leiper's first career MLB ejection. This is John Gibbons' 2nd ejection of 2016, 1st since April 27 (John Tumpane; QOC = Y [Check Swing]). This is Jose Bautista's first ejection since July 12, 2015 (Jerry Meals; QOC = Y [Balk]). This is Josh Donaldson's first ejection since June 14, 2014 (Tripp Gibson; QOC = Y [Balls/Strikes]). This is Rougned Odor's first career MLB ejection. This is Steve Buechele's first ejection since June 11, 1995 (Jerry Meals; QOC = N/A [Balls/Strikes]). This is Jesse Chavez's first ejection since September 18, 2012 (Jerry Meals; QOC = U [Throwing At]). This is DeMarlo Hale's first ejection since August 2, 2015 (Jim Wolf; QOC = U [Throwing At]). This is Dale Scott's first ejection since October 14, 2015 (Mark Buehrle; QOC = U [Also TEX-TOR]). This is Dan Iassogna's first ejection since August 22, 2015 (Terry Francona; QOC = N [Out/Safe]).